Daynas Valen was a Dunmer conjurer who came to Skyrim in search of the Gauldur Amulet. He first heard of the Legend of Gauldur and the Gauldur Amulet 100 years ago, and since then he had felt its power calling to him. He became so obsessed that he dedicated his life into researching the life of Gauldur and his three sons Jyrik, Sigdis, and Mikrul. After learning of the final resting place of the sons and fragments of the Gauldur Amulet, he began his first expedition into Folgunthur. However, he was unable to gain entrance without the ivory dragon claw and the expedition was put on hold. 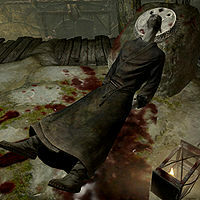 After ten years of searching, he traced the location of the ivory dragon claw to a collector in the city of Bravil in Cyrodiil, who he then killed and stole the ivory dragon claw from. He then fled to Anvil and boarded the Icerunner to Solitude. On the Icerunner's three week voyage from Anvil to Solitude, he met an adventurer who was going to seek his fortune in the ruins of Skyrim with his companions, and invited them on his expedition intending to use them as fodder for the traps and draugr within the tombs. Unfortunately, things didn't go according to plan, and he died along with the adventurers in Folgunthur. In his possession you can find the ivory dragon claw and his notes. His journal can be found in the camp outside Folgunthur. This page was last modified on 5 February 2017, at 03:55.